Approaching Manolson’s abstracted landscape paintings is a sensual experience — you’ll feel an immediate rush of attraction to and comfortable recognition of overlapping details mimicking rich organic life. Her style is quickly assessed — a blend of impressionistic color tones and gestural expressionism pulled together, evoking obvious themes. There are seasons in transition, vegetation at various levels of growth and decay, and the alternate movement of water and light exposing and concealing views within a swampy forest canopy — comfortable subject matter lulling you into a pleasant state of mind. This somnolent feeling passes quickly and a new perspective sets in — delighted confusion. As you shift your viewpoint and move closer, becoming intimate with the image, light refractions appear and markings of paint having been sanded away are discovered; new questions emerge and a sudden realization sets in: Manolson is experimenting. She challenges me to break the cardinal rule of not petting the art. “Go ahead, touch it and tell me what you see,” she said, encouraging me to inspect its surface texture. It’s a variety of arousing tactile surprises — surfaces that bring to mind the quality of shinysmooth leaves, with semi-wet, sticky oils conveying the gooey viscosity of decaying vegetation. Her gritty and sandy textures evoke hard transitional layers of sand, stone and tree bark. Manolson wants the viewer to become intimate with her work, to dive deep, to go beyond the surface to discover what’s been added and what has been taken away. For this, her fifth Clark Gallery exhibition, Manolson is presenting a new group of paintings that further expand upon her signature oeuvre — fluid glazes and strokes of manipulated oils on wood panel depicting her observations and meditations upon the impermanent reality of organic forms directed by regional aesthetics and sensibilities. Her paintings reflect the essence of her hometown of Concord, Massachusetts, where she’s unmistakably surrounded by Henry David Thoreau’s influence and attitude. Manolson begins the process by painting sketches en plein air at various locations, immersing herself within the environment. Her methods of observation are informed by her training as a botanist, and she may take photographs of a scene to capture atmospheric conditions and time. Each painting is then an amalgamation of various locations, assembled into compositions dictated by formal requirements that emerge as the image is constructed. The recent work is deeply conceptual — portraits of balanced contrasts in stasis and forms in flux moving into minimalism and playing with the idea of cyclical development. In the new paintings, she builds up surfaces to evoke ephemeral details as she’s done in the past, but she now counteracts the layering by reducing elements, physically removing the medium with spatulas, scrapers, sandpaper or water, cleaning out and widening the views. “Stasis/Flux” is the title of a new experimental painting on Mylar substrate. It’s a work that best exemplifies her reductionist approach, and informs the formal qualities and conceptual underpinnings of the rest of the paintings in the exhibition. As a result of Mylar’s non-absorptive quality, the fluid nature of oil paint is allowed greater expression. The medium floats on the surface producing a translucent and luminous end result. Conceptually and formally, “Stasis/Flux” is about being as minimally invasive as possible, knowing exactly when to stop and allowing a certain level of comfortable chaos. “The Mylar paintings were experiments, and when I realized what was possible, I wanted to recreate the same minimal quality on wood board,” Manolson noted. Her new direction is to construct translucent images welcoming negative space, encouraging spontaneous accidents evoking, again, snapshots of the natural world in transition, simplified to basic elements. This approach speaks of Manolson’s holistic attitude. It’s a continuum heading toward purer forms of reductionism, which may bring her back to the additive process. She accomplishes this new format not in a rushed frenzy, but slowly, methodically and in a studies manner. She’s arriving at formal conclusions the way that nature changes the landscape: over time, purposefully balancing its entropy. 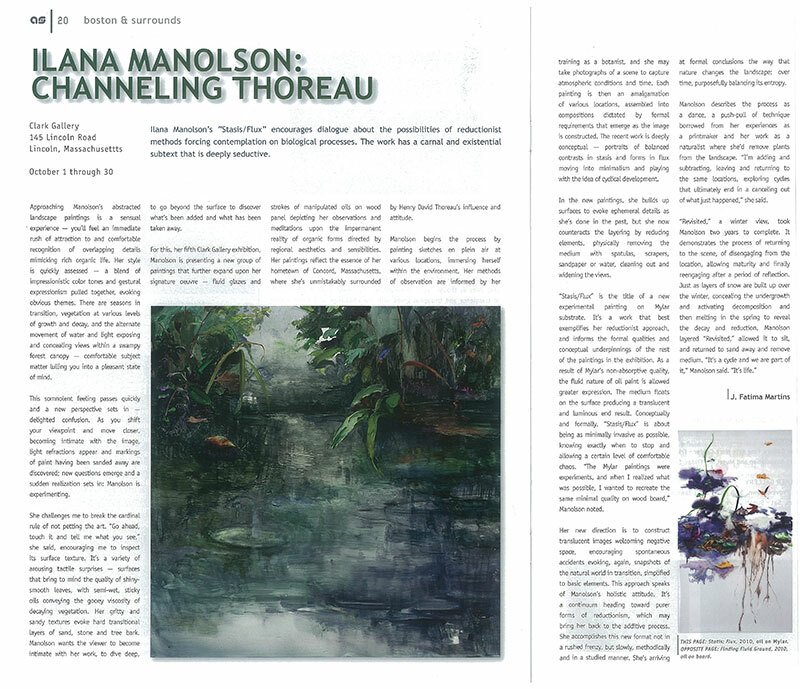 Manolson describes the process as a dance, a push-pull of technique borrowed from her experiences as a printmaker and her work as a naturalist where she’d remove plants from the landscape. “I’m adding and subtracting, leaving and returning to the same locations, exploring cycles that ultimately end in a canceling out of what just happened,” she said.